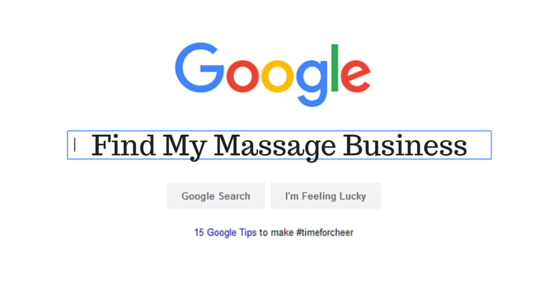 Writing Content for your massage therapy business website is one of the best ways to optimize your website for search engines and it is the best way to show that you know what you are talking about. Content helps build trust with the reader to turn them into a client. Content is really what the internet is all about. People want to find information. When you can provide a solution to their problem ( their search) and they can find that info easily (in the top spot on the first page of Google) then you are way ahead of the game! When they get content they will be content! Content is just everything and anything that can be found on your website: Your basic pages, blog, videos, slide shows, infographics, photos and articles. Put yourself in Google’s place. They are scouring the internet for the best information to fulfill their searchers dreams. It used to be that the main way they found that content is by following hyperlinks. It is hyperlinks that connect content and the search engines only means really of finding more and more websites. You can also tell them what is on your site by submitting it to them but that still does not guarantee your site will get found or listed. Up until recently (Panda/Penguin/Hummingbird) the majority of SEO depended on linking. Panda/Penguin are two distinct algorithm changes that Google devised in the last few years to clean up the internet and their search result. Panda is about content. Google wants original, unique, and shareable content. They want to see that you are an expert at what you do. They want to see that you are the authority on the topic and that you are trustworthy. Penguin was about links – getting too many websites to link to you using your keyword in the link was what used to make your site look popular. That isn’t so anymore. Now it is about natural linking – getting people to link to your pages/website because it is just amazing and good information! Put yourself in your readers/potential clients/ current clients shoes. What would you like to know about or learn about? The key to writing articles for your massage therapy website is to just start writing about the common questions that you find yourself answering all day long anyway! Write the same way you would talk to people. Writing content is about educating people about how massage works and why. It helps not only you, but the whole profession. About Me page – tell everyone about you! Let yourself shine! Make it personal! Create a page on every type of massage that you do. The real benefits of massage – be sure you know them! It isn’t really what you were taught in massage school! How often should someone come in for massage? Write about the interview process that you take people through and why/how it is important to your session and the results of the sessions. How often should people get massage? Write a FAQ’s page – what questions do you hear over and over from clients. Write about what it is like to get your first massage. You can even use your first ever massage as an example. Write about what makes for a good massage, a great massage and how to tell when you have a ‘less than ideal’ massage. Write about what massage really does – like makes you feel lighter, more centered and clear thinking. Write about how to massage your pet. You can refer to books or videos. This also could be a good affiliate program. Do you use aromatherapy? Even if you don’t, it could be a good topic to write about and share what oils you like best and what they are used for and yes – another affiliate program possibility. How much pressure is just right? Write about the issues of illegal massage and human trafficking that are happening today. Write about something you saw on your local news channel about massage or health. Read about the rich history of massage and write about various parts of it – the history of sports massage, massage at the Olympics, massage used by shamans, early Greeks etc. Follow my Pinterest Board on Massage in the News to look for news items to write about. Write about how the Affordable Care Act does have provisions to get massage covered by health insurance and that clients will need to be contacting their insurance companies and the office of the insurance commissioner in their state to find out what is happening and to make it happen. Currently states that consider massage therapists to be healthcare providers may have the opportunity to bill health insurance. Read more on the ACA and Massage. Write about the value of massage and how it is a necessity and no longer a luxury. Create a page of resources: your favorite blogs, websites on health and massage. Create a section for other massage therapists – become the resource in you area for others. Find affiliate programs that you can promote and make extra money. When not to get a massage – basic contraindications. Write up case studies and put them on your website. See also: how to write a case study. Read websites like www.massagetoday.com and www.massagetherapy.com for many ideas on what to write about and to research a topic you might want to write about but remember – keep it original. Just use the information for ideas. Watch the news for popular articles like this one in the Don’t Call it Pampering: Massage Wants to be Medicine in the Wall Street Journal and write about it in your own words. Share self massage techniques and tools and become an affiliate at amazon.com and make money selling them. Write about how to create a home spa environment and home spa treatments for a girls night out or special occaisions. Write about how massage is being used as a front for prostitution and for human trafficking and what can be done about it in your area and what is being done about it. Educate people on the Affordable Care Act and what can be and is being done to get massage covered by insurance. Share your list of pages of content here and what has worked best for your website. Which pages get the most attention? Everything I am writing about here, I learned from creating websites. I learned by using a system called Site Build it! which is now called Solo Build it! which includes ALL the instructions, tools, resources and the software you need to build a website that works. Try it now. Wow! YES! I am so inspired to put the info out there. This is an incredible list. Thank you!